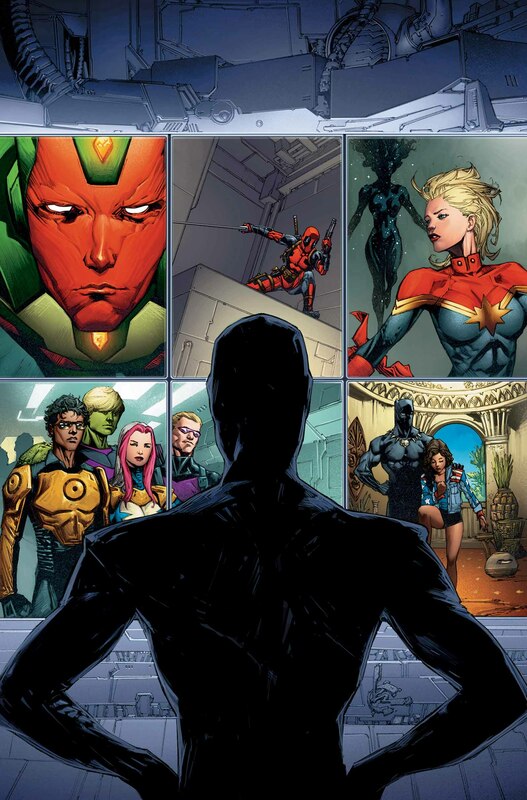 After Secret Wars, Avengers #0 is an anthology book that ties together the stories of the Avengers, the New Avengers, A-Force, the Uncanny Avengers, the Ultimates and the Squadron Supreme. Each team has a small vignette that ties their story into that of the Squadron Supreme. Stories like this can be tricky, since the reader is maneuvered between stories, but I found that though the story with the Squadron Supreme was meant to act like a segway into the other stories, it felt more like a distraction. It provided a lot of exposition, but I felt like it was at the cost of the story itself. Also, the information needed to jump into the comic, without prior knowledge of the characters and Secret Wars, was not provided. I feel like the purpose of a zero issue, is to lay the foundation for someone who wants to check out new titles. It does the job of introduction the Squadron Supreme, but beyond that it does not provide an easy entrance for the reader to the comic or to the subsequent tie-ins that come after it. I did enjoy the stand alone stories and each one felt like it could stand on its own. The first was between Scarlet Witch and Vision. Vision is being haunted by images of the past, what most of us would think of as ghosts. He has come to Wanda to tell her that he has made a decision of how to deal with the ghosts. I liked the story telling here, I’m a fan of both Wanda and Vision, and though the story was sad, it was also compelling. The art style was very pleasing for me, but there were some panels where memories could easily be confused with what was the present. woven into the story. I knew it was the A-Force story from the moment I turned the page, because almost all the people in the panels were women. That may sound strange, but when most media has more men than women in any given scene, it was sort of nice to see a captain of a starship and a scientist who were both female. Carol Danvers is leading the Alpha Flight station, and we see her sans her Kree helmet. I know we found out this week that she will no longer be donning the helmet, but it was still sad to see it go. My other favorite story from this comic was about Ms. America Chavez. The art is open and stunning, and it makes it easy to follow the story, even if the text boxes were a little confusing on the page. America is fighting monsters between worlds and closing tears in the universe. To close the holes, she must focus on a happy thought, and basically we see the softer side of America, as she uses her dancing skills rather than her punching skills to problem solve. There are also stories about Deadpool and the New Avengers in this comic, both of which set the stage well for the coming stories. All in all, if you are an Avengers fan like me, this is a great comic to pick up so you know where things are starting out after Secret War. I may also try to review “Captain Marvel and the Carol Corps Issue 2” tomorrow, if I have the time. I picked up both titles along with Harley Quinn and some Catwoman this week. DC is slowly winning me back as a reader, I think. 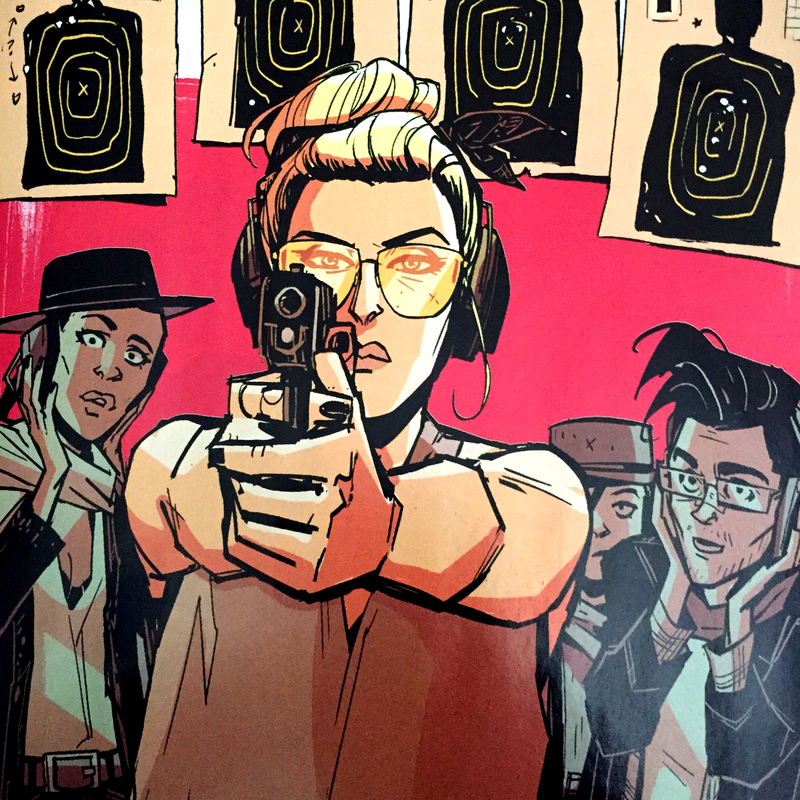 Black Canary Issue 2 was written by Brenden Fletcher, Annie Wu is the artist and Lee Loughridge is on colors for this issue. That’s one thing I really love about this comic so far, is that you can clearly see each person’s contribution to the comic, if you are paying attention to it. At first glance, one of my favorite thing about this issue was some of the more unique ways they told the story. There were full page spreads of information and graphics, that reminded me of magazine cutouts, tour posters and snap shots. It’s an interesting choice story wise, because those pages are used to tell the story in a very different way than the pages that have the traditional panel/dialogue layout. It also had a diagram at one point that showed Dinah training her manager in hand to hand. I personally love stuff like that. Deviating from the “traditional” comic layout is something I see more and more in stories like Hawkeye, Young Avengers, The Wicked and the Divine. I like that these storytellers (the artists, the writers and the colorists) are playing with form, and finding new and interesting ways to tell their tales. Loughridge continues to shine in this issue with the approach to color that is used. The color palettes used in this issue definitely help to dictate to the tone of the story and they compliment Wu’s art style so well. The whole complimentary vibe between the art and the colors gives me a very punk rock feeling, which well matches the story that Fletcher is telling. In this issue, we continue to learn more about Dinah’s past and the past of the band. I liked the story telling and that there was still the rocker vibe, even though they weren’t performing in this issue. I’m interested to see how this Dinah is different from the Black Canary that I know and love, and I plan to continue to pick up future issues of the series. It’s got a good story and great art, what more do you need? At one point in the comic, Dinah uses a pair of what looks like clarinets or flutes to fight off a bad guy. It was just a very cool moment for me, since I’m a fan of characters that use staves as their weapon. 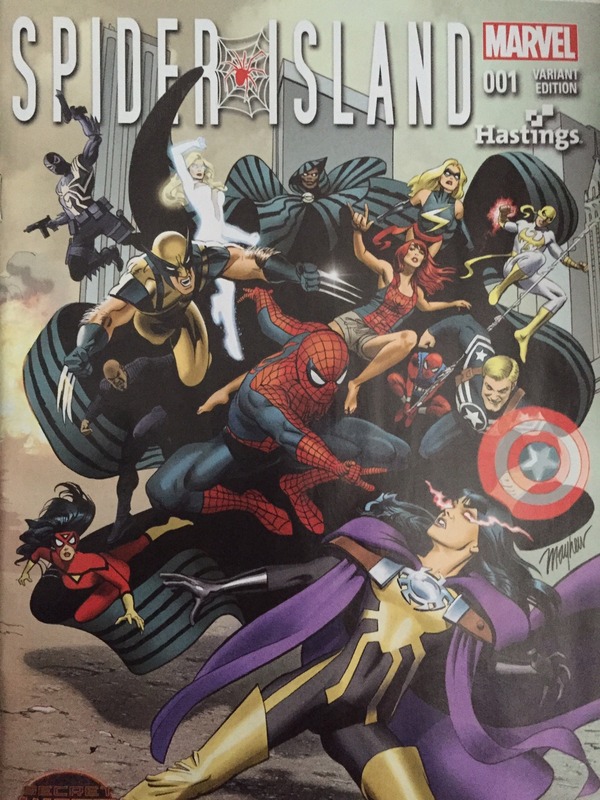 Spider Island is the third Secret Wars title that I’ve picked up to read. I’ve also followed A-Force and Captain Marvel and the Carol Corps and I’m enjoying all of them. Spider-Man is one of the titles that initially got me into reading comics, so it is interesting to see Marvel’s main universes collide and to see what has happened in Spidey’s corner of the universe. Spider Island is written by Christos Gage, drawn by Paco Diaz, and colored by Frank D’Armata. I got the Hastings Variant (pictured to the left), since that is the closest thing I have to a LCS. Agent Venom is the narrator for the comic and a good portion of the story is set up through his monologue. I’ll be honest, this isn’t my favorite way of establishing setting and backstory, but I think that Gage really nails Flash Thompson’s character and his voice, so I was a bit forgiving. I still wonder if there could have been more showing and a bit less telling in this comic. Diaz is a strong artist and I think his art could have been relied on to “show” us a little bit more. That being said, Gage absolutely nails Flash Thompson as a character. Flash is a personal favorite of mine and I’ve read a lot of his recent story lines. Flash always has an underlying lack of confidence that I think makes him very human and very relatable. Gage also mentions Flash’s past with Peter Parker/Spider-Man and how Flash looks up to Peter. I liked seeing this, since really, Spider-Man is a big part of why Flash has become a hero and now he is a big part of why Flash continues to be a hero. If you’re a fan of Agent Venom, I think this is a comic you will really enjoy. Diaz does a great job with shots with a lot of characters in them. Each character still looks distinct even if they are in the background of the panel, there is an attention to detail in each panel and each character, which I really liked. He also has a good talent for showing motion in this comic, and there is a lot of action, so that is important. I plan to pick up the next few issues that come out and I’m excited to see where this story goes. Also they turned another one of my favorite characters into a vampire, so I’m straight up tickled to see where that ends up. If you’re thinking about picking up some of the Secret Wars titles, I’d say A-Force, Captain Marvel and the Carol Corps and Spider Island are all good stories to add to your list. I’ll be honest, it’s been awhile since I’ve picked up a DC title. I followed Wonder Woman after the New 52 reboot, and a few issues that Catwoman was in, but other than that, my DC reading has sadly lacked. I’m trying to change that, especially with all the awesome things I’ve heard about some of the new DC titles like Gotham Academy, Bombshells and Convergence. I got to listen to Marguerite Bennett talk a little about Bombshells on the Arc Reaction Podcast (I believe the interview with Marguerite is in the Denver Con 1 episode), and it made me giddy to see it when it comes out. Black Canary 1 was written by Brenden Fletcher, Annie Wu did the art, and Lee Loughridge was the colorist. First of all, can I just say I LOVE the art in this issue? I really enjoyed Annie Wu’s art on Hawkeye, and here it fits perfectly with the tone of the comic. It’s slightly gritty, but still very sleek. I like that, because you get the hard edged representation of the Black Canary band, but it still feels very feminine to me at the same time. Also, the colors in this issue really accented the art. There are bright pinks, dark purples, and the colors change as the tone of the story changes. It really helps guide the reader tonally, because the can just look at the page and get a vibe for what is about to happen. Similar to The Carol Corps, which I reviewed last week, Black Canary is taking a character that we’re familiar with, but she’s in a very different setting. She does by “D.D.” and the name of the bad is actually Black Canary. She’s wearing her classic leather jacket and fishnets, but now there’s more of a punk rock vibe to her. This issue does a great job setting up the story and leaving breadcrumbs for reveals that will most likely happen in the future. There are mysteries about D.D.’s past and the past of one of her bandmates, Ditto. There are people coming for Ditto, and over the course of the comic, D.D and her bandmates make a pledge to protect her. I really enjoyed seeing a character I’m fairly familiar with, in a different space entirely. I also liked that it’s a band full of women. It’s a very different sort of team than we’re used to seeing in superhero comics, but it’s a team all the same, and that’s clear by the end of the comic. D.D. also defends a group of 3 women from danger at one point in the comic, and though we don’t explicitly know what the danger was beyond a group of scary looking guys, it’s a good moment. We see D.D. jump from the stage, and put herself directly between these women and the danger. After things settle, they thank her and ask about where she got her boots. That moment probably stuck out the most to me in the comic, since often when we see people thanking a hero, they are gushing with hero worship. This felt more like appreciation and connection. I’ll definitely be picking up future issues of this comic. I want to know more about D.D.’s past and the past of her bandmates. All in all, it was a very intriguing read, and the art complimented the story perfectly. Normally I’d like to do this review on Thursdays, so it gives readers a chance to pick up the comic, but it’s been a bit of a crazy week for me, so here it is a day late. This week the spotlight is on: Captain Marvel and the Carol Corps issue 1 by Kelly Sue DeConnick and Kelly Thompson, with David Lopez on art. Be ye aware, SPOILERS AHOY! If you haven’t read the comic yet, wait until after you have to read this review. Captain Marvel and the Carol Corps is part of the Secret Wars event that Marvel is currently doing, so it’s a departure from the storylines we’ve previously been following with Carol Danvers/Captain Marvel. That’s not to say there aren’t a few familiar faces. Helen Cobb is a member of the Banshee Squadron and we also see Carol’s tenacious and adorable side-kick Kit, all grown up as the Thor of Hala Field. With the multiverse destroyed, all that was left was Battleworld, which is ruled by Victor Von Doom. Doom is more or less seen as the god of their world and in typical Doom fashion, he’s taking credit for everything. The sky, the sun, the moon, even Captain Marvel herself is a “Gift from Doom.” From what we see in this issue, both the Thor Corps and the Carol Corps are directed by Doom and his minions. They are expected to carry out his will unquestioningly. Which I kind of loved, since we even have people in the real world that believe that sort of thing. But of course, one of Carol’s companions, Bee, gets her research on anyway. She questions Doom’s teachings and though all her other squadron mates know about it, Carol only discovers it in this issue. Carol sees the logic in Bee’s argument that something is amiss, and when they are sent out on their next mission by Baroness Cochran, she decides to investigate further. 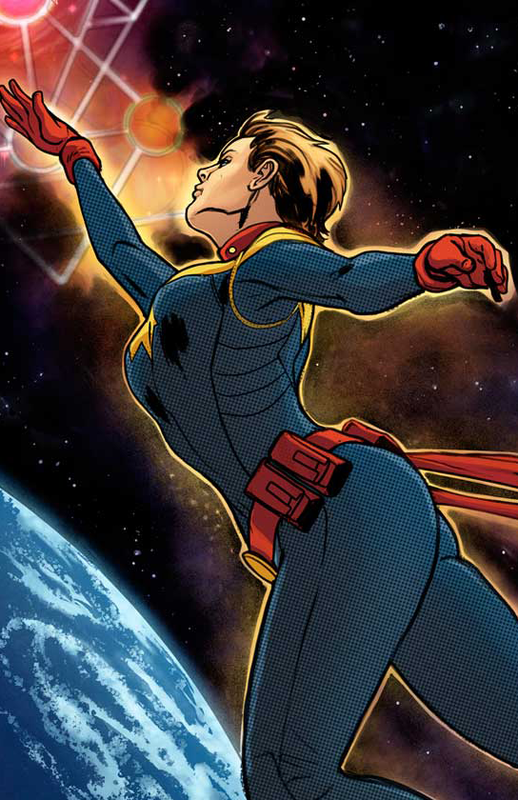 Investigating further happens to mean that she ends up diving for a ship as it’s blowing up, as we may have come to expect from Captain Marvel. That is something I really liked about this issue, that even in this world, it’s very clear that Carol is still Carol. She’s still going to follow her moral compass, even if it puts her at great risk. She’s always been the self sacrificing sort and that’s no different in this new series. For a moment, we’re left to question whether or not Carol made it out, but of course she did. She’s also saved the life of one of the men on the ship her squadron blew up, and based on his look, I’m sort of hoping it’s James “Rhodey” Rhodes. There were a lot of military tones to this, which is something we know Carol has a background in because of her Air Force days and have seen hints at it before, but here, we see Carol totally in that element. I thought that was very cool, and you can tell that the authors have a familiarity with the subject matter and how things run for a group like Banshee Squadron aka “The Carol Corps”. DeConnick has done something similar in past issues of Captain Marvel, when Carol time traveled and met the original Banshee Squadron in World War II. It was awesome to see the past team, but it’s even more awesome to see Carol leading her own team. I also liked that each Carol Corps member is distinct and has her own sense of style. I love the art style that Lopez has for this band of ladies. Sometimes in comics women can look a lot alike, and therefore can be hard to distinguish. In this comic, each of the characters has a very different look to them, so it’s easy to tell which character is which. The panels with targeting systems were also very cool, since it gives us a really good indication where Carol as she is flying with her Squadron. Something I haven’t really seen elsewhere in a comic, recently. It was a very nice touch. I also like this because there’s diversity on Carol’s team, just like there are in the real world Carol Corps (Meaning the fans). My personal favorite from the Corps was “Maggie ‘Mackie’ McMorrow, Call Sign: Big Mack” because I see a bit of myself in her, at least in appearance. But the fact of the matter is, having several ladies, all who look different and possess different personalities, leaves a lot of room for representation and characters for female readers to identify with. Not saying dudes can’t identify with ladies, they totally can, but it tends to be lady representation that lacks when it comes to gender. Over all, I really liked this comic and I’m excited to see where things lead from here. It’s the first title I’ve read that falls under the Secret Wars hub, and that actually makes me excited to see what other people are doing on other Secret Wars titles.